The IBM InfoSphere Information Server and the IBM Blade/GRID offering is a revolutionary new software/hardware platform (leveraging Linux on Intel) that helps organizations derive more value from the complex heterogeneous information spread across their systems. It enables organizations to integrate disparate data and deliver trusted information wherever and whenever needed, in line and in context, to specific people, applications, and processes. 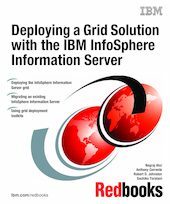 This IBM Redbooks publication describes a scenario for migrating an existing InfoSphere Information Server parallel framework implementation on a Red Hat Enterprise Linux AS 4 platform to a high availability grid environment involving four machines comprising one conductor node and three compute nodes. The high availability environment involves one of the three compute nodes serving as a standby conductor node that takes over the conductor role when the original conductor fails. The steps involved in migrating the existing infrastructure to the high availability grid infrastructure and enabling existing IBM WebSphere DataStage, IBM WebSphere QualityStage, and IBM WebSphere Information Analyzer jobs to exploit the grid environment are described here.